Click below to find each species in our store! 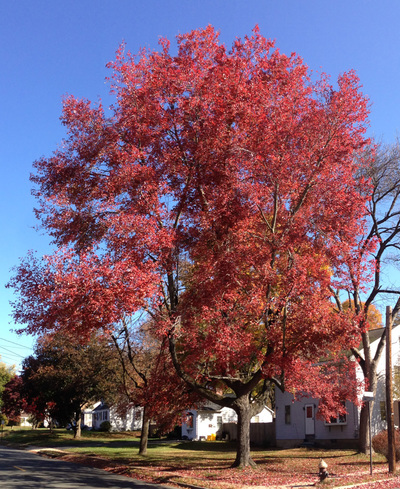 Red Maple - at maturity it often grows to a height of around 49 ft. It is well named for its flowers, twigs and seeds are all red to varying degrees. 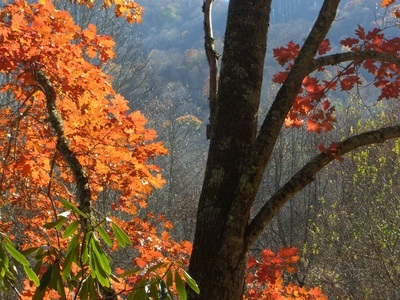 Among these features, however, it is best known for its brilliant deep scarlet leaves in autumn. Sugar Maple - best known for its bright fall foliage and for being the primary source of maple syrup. 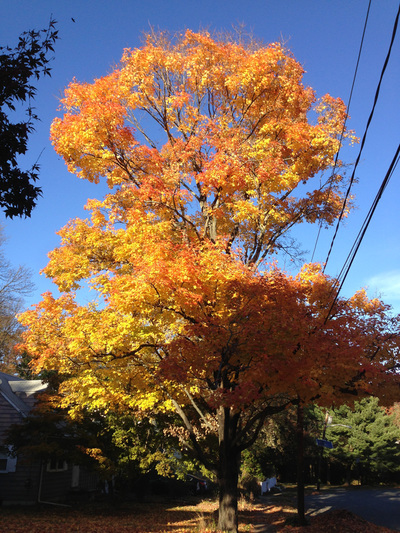 Relatively fast growing, a sugar maple normally reaches heights of 82–115 ft tall. A 10-year-old tree is typically about 16 ft tall. Red Oak - bark has bark ridges that appear to have shiny stripes down the center. It grows straight and tall up to 92 ft. In autumn the leaves turn a rich red, sometimes brown. White Oak - the acorns are much less bitter than the acorns of red oaks. 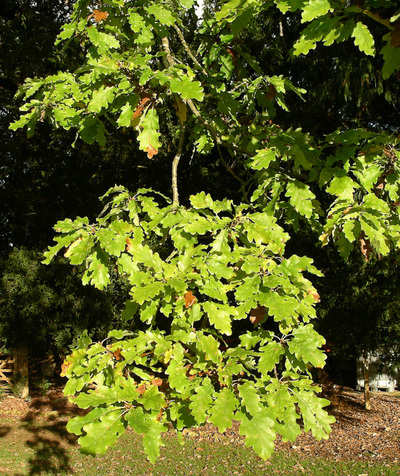 They are small relative to most oaks, but are a valuable wildlife food, notably for turkeys, wood ducks, pheasants, grackles, jays, nuthatches, thrushes, woodpeckers, rabbits, squirrels, and deer. The young shoots are readily eaten by deer, and dried oak leaves are also eaten by white-tailed deer in the fall or winter. 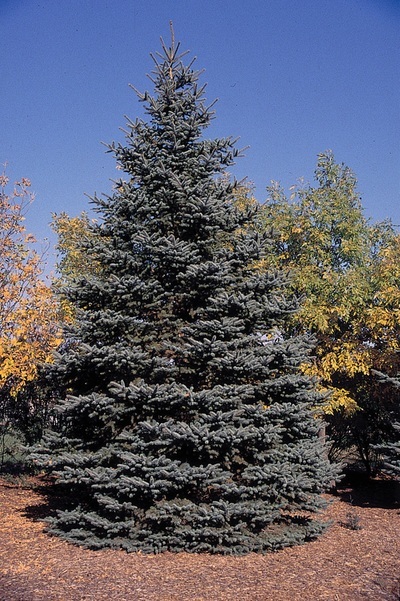 Colorado Blue Spruce - when planted in parks and gardens it seldom exceeds 49 ft tall by 16 ft wide. It has densely growing horizontal branches. It has scaly grey bark on the trunk with yellowish-brown branches. Waxy grey-green leaves, up to 1 in long, are arranged radially on the shoots which curve upwards. 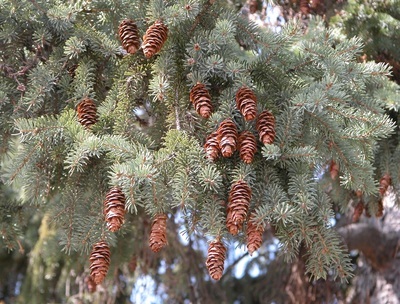 The pale brown cones are up to 4 in long. 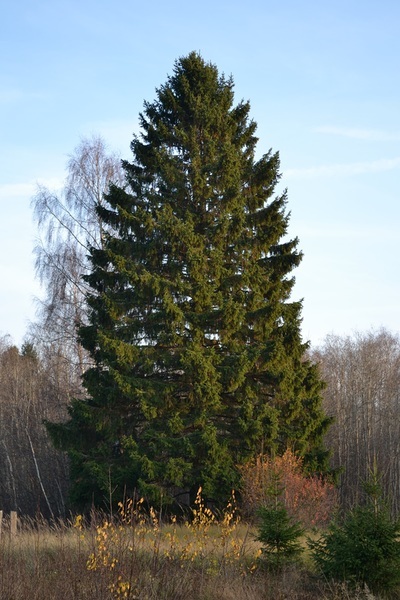 Norway Spruce - it grows up to 180 ft. tall, and bears needles 0.5–1 in. long and cones 3.5–6.5 in. long. It is used as the main Christmas tree in several cities around the world. 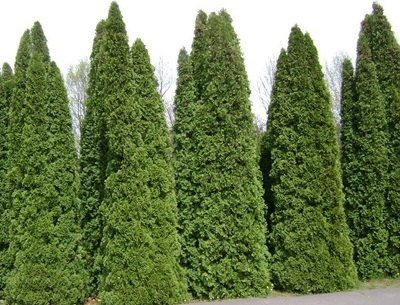 White Cedar - a small tree, growing to a height of 33–66 ft tall with a 1 ft trunk diameter. The tree is often stunted or prostrate. The branches may take root if the tree falls. White Pine - they are popular as live Christmas trees. 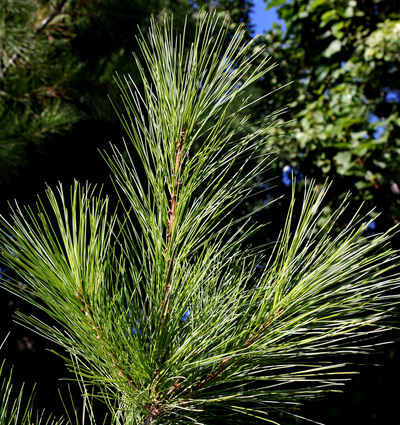 White pines are noted for holding their needles well, even long after being harvested. They also are well suited for people with allergies, as they give little to no aroma. A standard 6 ft tree takes approximately 6 to 8 years to grow in ideal conditions. White Spruce - grows normally to 49 to 98 ft. tall, but can grow up to 130 ft tall with a trunk diameter of up to 3. ft. The bark is thin and scaly. The leaves are needle-like, 0.5-0.75 in. long. White spruce is extremely hardy in low temperatures. 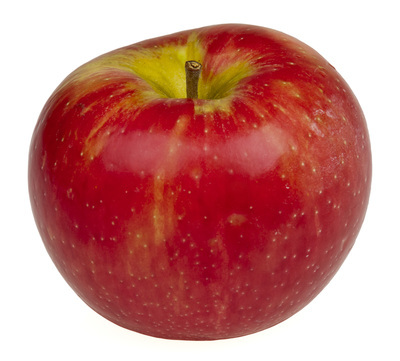 HoneyCrisp Apple - a late midseason apple that matures about one week after McIntosh. Flesh is juicy sweet with a unique taste best described by its name, Honeycrisp. Golden Delicious - a large, yellowish-green skinned cultivar and very sweet to the taste. It is prone to bruising and shriveling, so it needs careful handling and storage. It is a favorite for salads, apple sauce, and apple butter. 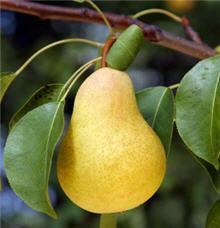 Bartlett Pear - a summer pear with fine dessert quality make it a popular seller at fresh markets. Kieffer Pear - a hardy tree. It grows rapidly, lives long, is disease-resistant and bears a large crop. The golden yellow fruit has white flesh that is crisp and coarse in texture—excellent for canning, baking, preserves and pear honey. The tree produces fruit late September to October. 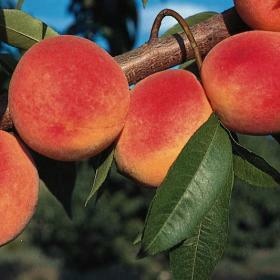 Redhaven Peach - produces an abundance of red-blushed, yellow skinned freestone fruit with firm, sweet yellow flesh. An excellent choice for canning and freezing, as well as fresh eating and making jams and jellies. Clusters of fragrant pink flowers emerge from deep rose buds in early spring, and foliage turns bright gold in fall, making this an attractive specimen for the landscape. This self-pollinating selection will set a heavier crop if planted near another variety of the same species. Red Osier Dogwood - this medium to tall shrub can grow 4.5–12 ft tall. 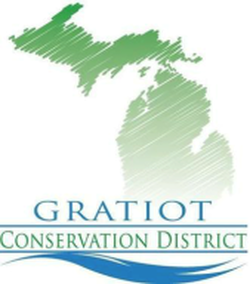 It is often used for waterway bank erosion protection and restoration because its roots retain soil so well. 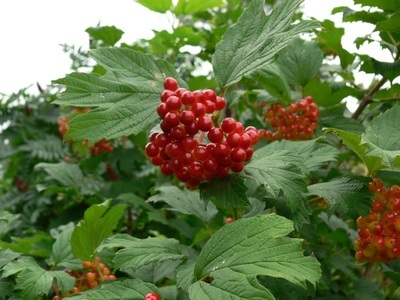 Highbush Cranberry - grows on well-drained, moist soils. Moderately shade-tolerant. 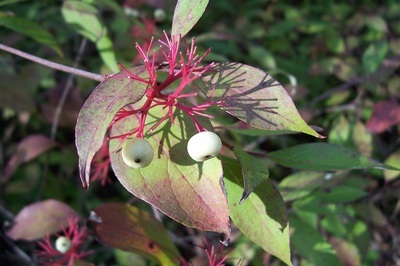 Produces white flowers; birds eat its scarlet fruit in later winter. 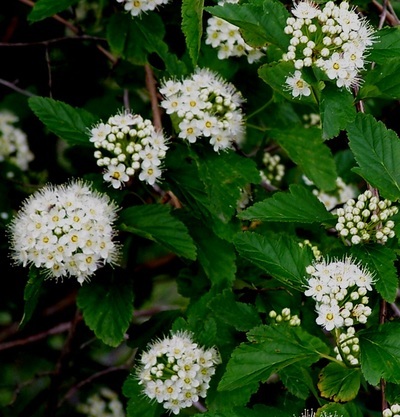 Common Ninebark - tolerates sun or shade. Flowers are an excellent nectar source and fruits are favored by several bird species. 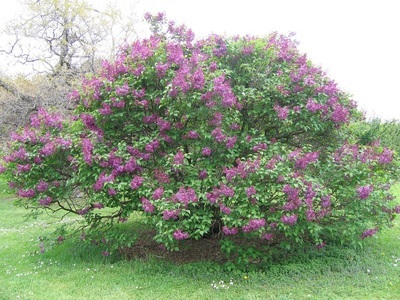 Lilac Bush - a very popular ornamental plant in gardens and parks, because of its attractive, sweet-smelling flowers, which appear in early summer just before many of the roses and other summer flowers come into bloom. It is a large deciduous shrub or multi-stemmed small tree, growing to 20–23 ft high. 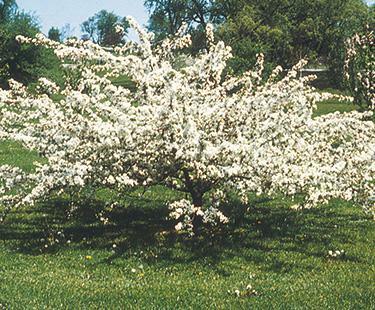 Sargent Crabapple - a dense, spreading, horizontally-branched shrub that may be grown as a dwarf tree. As a shrub, it typically grows 6-8 ft tall and spreads to 15' wide. Pink buds open to a spring bloom of fragrant, white flowers. Flowers are followed by small, red crabapples which mature in the fall. Fruits are long-lasting and attractive to birds. 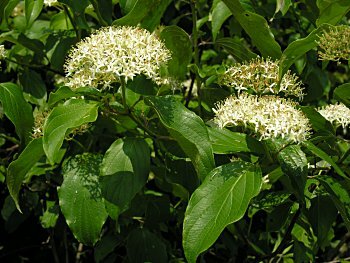 Silky dogwood - a medium-sized deciduous shrub that is typically found in moist lowland areas, swamp borders, floodplains, shrub wetlands, and along streams and ponds. Twigs and leaf undersides have silky hairs, hence the common name. This dogwood typically grows to 6-12’ tall with an open-rounded form. Tiny yellowish-white flowers bloom in late spring to early summer. Flowers give way to attractive berry-like drupes that change from white to blue as they ripen in late summer. Birds are attracted to the fruit. 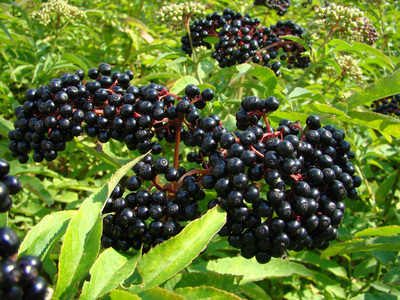 Elderberry - bushes bear large clusters of small white or cream-colored flowers in late spring; these are followed by clusters of small black, blue-black, or red berries. The bushes normally grow to 9.5–26 ft tall. Butterfly Bush - a flowering shrub that attracts butterflies. Prefers a loam soil in full sun protected from the wind. Dies back to roots during winter. 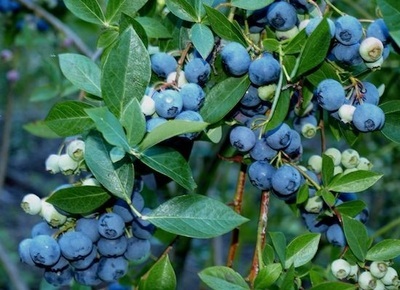 Blueberry Bush - an upright bush with a relatively shallow, fibrous root system and woody canes. Fruit is borne on buds formed during the previous growing season in late summer. Blueberry plants leaf, flower, and fruit in June. They are used as hedges, shrub borders, beautiful ornamentals or for wildlife. Red Raspberry Bush - produces crops in two seasons, with a light crop in June followed by a heavy crop in September. 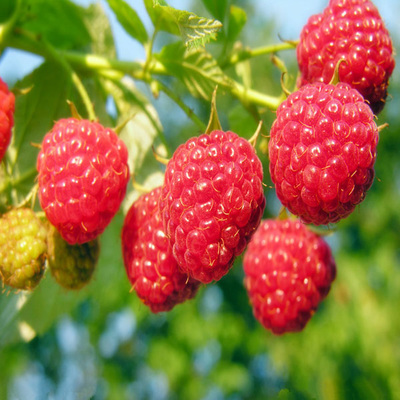 The berries are medium-size, tart, juicy, rose-red raspberries with small seeds. Preferred uses include fresh eating, frozen, and in preserves and pies. 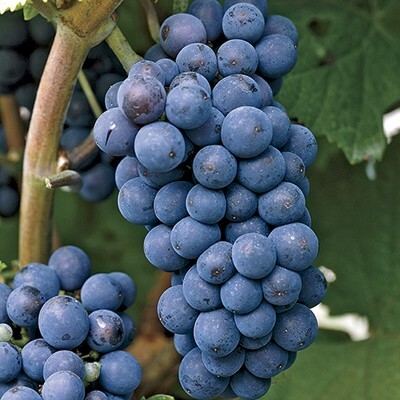 Concord Grape - a cultivar used as table grapes, wine grapes and juice grapes. They are often used to make grape jelly, grape juice, grape pies, grape-flavored soft-drinks, and candy.